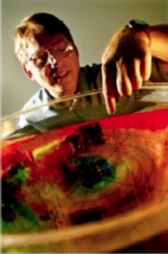 Prof. Dowling studies planetary atmospheres and specializes in atmospheric dynamics and thermodynamics. He is the Principal Investigator on the development of the EPIC Atmospheric model, funded by NASA and NSF, which is a general circulation model (GCM) designed for planetary applications. EPIC stands for "Explicit Planetary Isentropic Coordinate" and is the leading model for the atmospheres of the gas giants Jupiter, Saturn, Uranus and Neptune. The model can also be used to simulate the atmospheres of terresrial-class atmospheres, including Venus, Earth, Mars and Titan (a large moon of Saturn with a substantial atmosphere). Some topics Prof. Dowling and his students and postdocs are working on include: Jupiter's Great Red Spot, thunderstorms on Jupiter and Saturn, jet-stream stability, Venus and Titan spinup and superrotation, and the dynamics of vortices and clouds on Uranus and Neptune.